Mañjushrimitra (Skt. Mañjuśrīmitra; Tib. འཇམ་དཔལ་བཤེས་གཉེན་, Jampal Shenyen; Wyl. 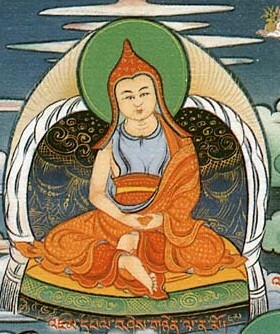 ‘jam dpal bshes gnyen) — one of the early masters of the Dzogchen lineage. He was a disciple of Garab Dorje and the main teacher of Shri Singha. He is famous for arranging the Dzogchen teachings into three classes: the Mind Class (Tib. སེམས་སྡེ་, sem dé), Space Class (Tib. ཀློང་སྡེ་, long dé), and Pith Instruction Class (Tib. མན་ངག་སྡེ་, mengak dé). His last testament, which he conferred upon Shri Singha before passing into the rainbow body, is called the Six Experiences of Meditation. Dudjom Rinpoche, The Nyingma School of Tibetan Buddhism, Its Fundamentals and History, trans. and ed. Gyurme Dorje (Boston: Wisdom, 1991), vol.1 pages 490-494. Nyoshul Khenpo, A Marvelous Garland of Rare Gems: Biographies of Masters of Awareness in the Dzogchen Lineage (Junction City: Padma Publications, 2005), pages 38-39. Tulku Thondup, Masters of Meditation and Miracles, edited by Harold Talbott (Boston: Shambhala, 1996), pages 59-61. This page was last edited on 13 September 2011, at 14:21.